Did you know the origin of yoga belt and yoga brick? There are so many other uses of the belt and brick which help us to improve the quality of the asana. When Mr. Iyengar was asked as to how he got the idea about the belt and brick, he said that he had seen a statue of Narasimha located at Hampi, in the Southern Indian state of Karnataka. This statue is in a yoga posture ¡V Sukhasana. Narasimha is the fourth incarnation of Vishnu, one of Hinduism's most popular deities. 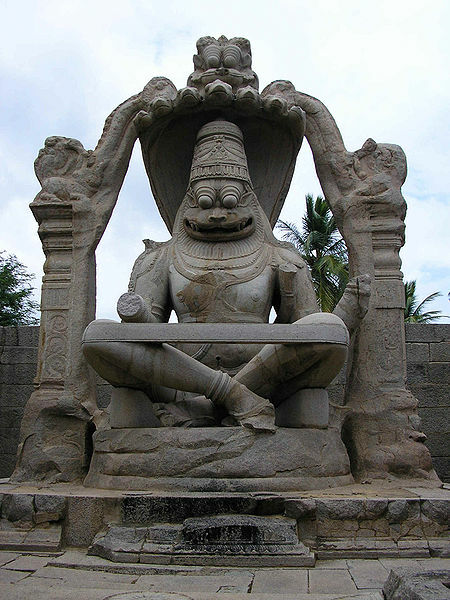 Narasimha has a human-like torso and a lower body, but with a lion-like face and claws. He is known primarily as the 'Great Protector', who specifically defends and protects his devotees at the times of need. This monolithic sculpture of Narasimha is a 6.7 metre tall and about 500 years old.This statue is in a yogic posture with a cloth/belt wrapped around his knees and bricks underneath his thighs. Mr. Iyengar was thinking about what were these belt and bricks doing there? Did they use props even then? Then Mr. Iyengar went through some ancient literatures and found that it was clearly mentioned in some text that about 800 years ago, about the story of this half-man/half-lion, and also mentioned that Narasimha has a yoga belt over his crossed legs and bricks under his thighs. And the text further states that in this posture, Narasimha gives the impression that he is ready to teach his devotees the secrets of yoga that require knowledge about the firm control of the 5 pranas and 5 senses of perception, which is a pre-requisite to be able to mediate, and also states that the belt and bricks depict how the anger and ferocious form Narasimha is calmed. The use of props is as ancient as some of the yogic texts. We must thank Mr. Iyengar not only for reviving interest of the common man in yoga but also for rediscovering this belt and brick which would have been lost if not for his sharp observation and his vision. Copyrights © 2019 Yoga Place. ALL RIGHTS RESERVED. Designed by Josephine YU.